Between January 2010 and November 2014, 47 individuals have been killed due to their real or perceived sexual orientation or gender identity. 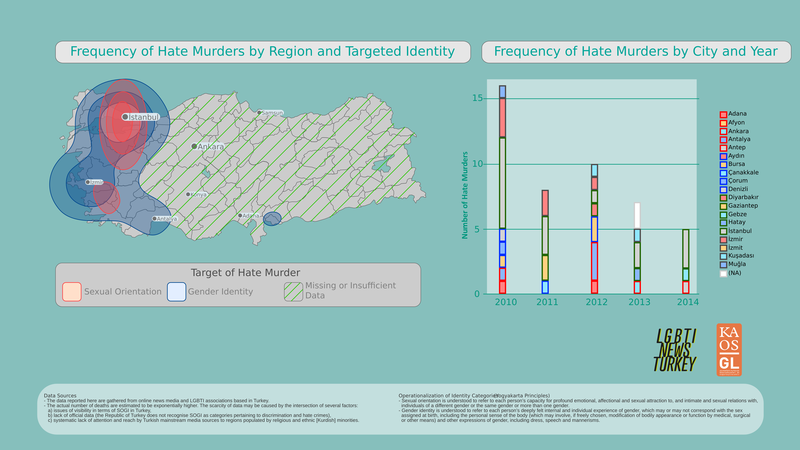 These deaths are represented in the infographic below (pdf, source, license), with data collected by LGBTI News Turkey volunteers from various online news media and LGBTI associations. c) Systematic lack of attention and reach by Turkish mainstream media sources to regions populated by religious and ethnic [Kurdish] minorities. Quite some time has passed since Kaos GL began to organize activities in a number of cities, calling them “Local Steps Against Homophobia”. Beginning with a few cities, the activities have spread all over Turkey. The slogan “We don’t want the ghettos, we want the whole city” has begun to be realized. Painting Antep’s streets with the colors of the rainbow, Zeugmadi LGBTI hosted a series of activities in honor of its first year. The culmination of these activities, however, was its participation in a September 1st World Peace Day gathering, on the anniversary of Antep’s LGBTI organizations’ coming out on the street. While the LGBTI community, on the one hand, were marching to their slogan “Homosexuals will not be silent”, the police walkie-talkies were not silent at all. We heard police say, through their walkie-talkies as they were standing just beyond the journalists who were following the story, the question “Captain, these queers are conducting a peace demonstration. What shall we do?” Zeugmadi LGBTI was not the only one organizing the demonstration. Nevertheless, one of the gathering’s most enthusiastic and sizable groups was the LGBTI participants. After the demonstration, upon a invitation by İlkyaz Şikayetçileri (“Spring Malcontents”), the stairways of Yeşilsu were painted with the colors of the rainbow. At one point, the shopkeepers nearby joined in the painting effort. A one-year organized effort has carried the freedom march one step forward.